A desperate king, a dying princess and an orphaned boy who won't speak of the horror that claimed his pack. Emma Chase is the Caller of the Blood and is destined to command the magic of all shapechanging races. But when the time comes, Emma realises that at her current power level she is unable to save the dying wolf princess. The only chance she has is to finish the ritual that she and the Jaguar King didn't finish. But old enemies have been bidding their time and have just seen the chance to kidnap Emma for their own cause. 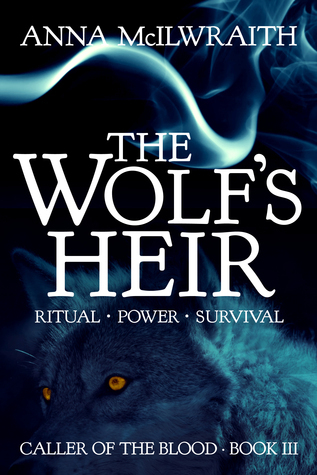 Emma's promise to the wolves have started the motion that will push her to her limits of her mind, body and soul, and finally, awaken her ancient powers. This book has been by far the one that took hold of my heartstrings and ripped them completely out. This book has been absolutely amazing to read, there've been so many questions answered, but then they created so many questions. You saw a lot of depth of a lot of the characters and understand deeper connections and even some of the politics. I really felt for Emma in this book, what she experienced was intense and it has been one of the hardest things to read for me. Emma has been emotionally destroyed with what happened with Allen her vampire ex-boyfriend. There's a bit of sexual violence in this book, so if you can't read that then I wouldn't recommend reading this book. I was surprised that the author got into the gritty details where most authors shy away from it. I felt that this book set the way for the books that were going to come after and set the tone of the story and really it made Emma more aware of the dangers out there and would take more precautions and I would think that the rest of them would want to keep Emma informed at all times.